Recently, AsiaNews, Bishop John Ricard, Chairman of the Committee on International Policy of the United States Catholic Conference, Mr. Mario Mauro, Vice President of the European Parliament, and many others have sent you or other Chinese ambassadors elsewhere a list (attached) (henceforth called the List) of Chinese Roman Catholic bishops and priests who have vanished under detention, have been imprisoned, have been sent to the labor and re-education camps, or are otherwise kept from carrying out their ministry by the Chinese government. They indicated their grave concern about those imprisoned and restricted religious and clergy on the List and appealed to your government for their immediate release so that they could go back to their pastoral duty without any interference from the government. We, the Cardinal Kung Foundation, representing thousands of Roman Catholics in the United States and Europe, are joining AsiaNews, Bishop Ricard, Mr. Mauro and many others, not only for the immediate release of these imprisoned religious (on the List), for the immediate relaxation of your very severe surveillance and house arrest of religious (also on the List), and for your release of all laity, religious, priests, and bishops who are nowhere listed, but also for the total and unconditional exoneration of all criminal charges against any of these religious (on or off the List) and against thousands of others as explained below. Since 1949 when your government took over China, literally tens of thousands of Roman Catholic bishops, priests, and their faithful were imprisoned for 5, 10, 20, 30, or even 40 years. Many of them, such as Bishop Fan Xueyan of Baoding, Fathers Beda Zhang BaiDa and Chu ShuThe of Shanghai, and Bishop Guo Kexian of Shandong died in jail. Many of them, such as those on the List, are still in jail. Many of them were released after a very long period in jail. Some of those released are still living in China or in other parts of the world. 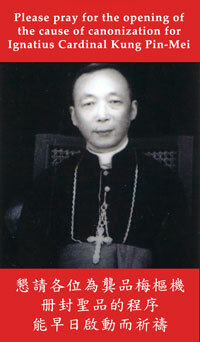 Some, such as Cardinal Ignatius Kung Pin-Mei of Shanghai, and Archbishop Dominic Tan Yee-Ming of Canton (24 years in jail without a trial), have since died. It does not matter to your government if they are dead or still living; they are still considered criminals because the "criminal" charges against them were never erased by the government. For example, Cardinal Kung, released and exiled after spending 32.5 years in solitary confinement and house arrest, is still considered a criminal by the Chinese government, even though he is now dead. 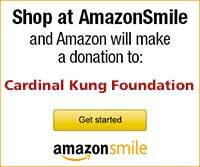 There are thousands more like Cardinal Kung and Archbishop Tang. They are all loyal citizens of China and they love China. Supporting but going beyond the goal of the AsiaNews campaign, the Cardinal Kung Foundation appeals to you that all these prisoners, both living and dead, be officially and posthumously exonerated of so called crimes of which the Chinese government falsely and unjustly accused them, some as long as five decades ago. In doing so, the reputation of these living and dead religious prisoners of conscience in China can be restored. Those who are still living can at least once again enjoy equal treatment in the society. During the past decades, many political non-religious prisoners have been exonerated of their crimes by your government. We believe and urge your government to do the same for the religious prisoners referred to above. To do so, along with releasing all religious prisoners referred to above, will be a powerful testimony to the Chinese government's respect for and adherence to human rights and liberty. Thank you.